The Battery Ground Fault Simulator is a demonstration/training tool for the Megger Ground Fault Tracer (BGFT) and the Megger Battery Ground Locator (BGL). The instrument provides a simple and easy method for simulating different characteristic ground faults. It is capable of simulating positive or negative earth grounds, resistive and phantom capacitive grounds as well as single or multiple grounds. 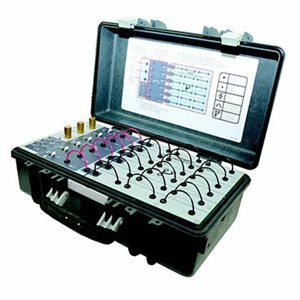 The battery ground fault simulator provides the ideal training platform for learning to characterise and locate battery ground faults.